After they graduate from the University of Iowa, many alumni choose to remain in the state of Iowa, whether setting down new roots or returning to the places where they grew up. They start families, create businesses, and become community leaders. Now, through television ads and a dedicated website, the university is paying tribute to such alumni by highlighting the way they make a difference every day in communities large and small across Iowa. After starting her career in Tennessee, Teresa Alesch, 10MA, realized there was no place like home. In 2005, Alesch and her husband, Cody, both Iowa natives, moved from Nashville back to northwestern Iowa. Alesch landed a job teaching high school English, sociology, world history, psychology, and reading in the Graettinger-Terril Community School District, where she also coached volleyball and track and served as the National Honor Society advisor. The couple started a family and also enjoyed volunteering at church and helping build a school wrestling program. Things were going so well that Alesch decided she was ready for a new challenge and enrolled in the UI Graduate College's Teacher Librarian Program as a distance learner. She took a combination of online and on-campus course work, enjoying the experience so much that she's considering obtaining a superintendent endorsement through distance education at the UI College of Education. "I wouldn't have my advanced degree if it weren't for the UI," she says. "It was an excellent way to approach education, well-balanced and rigorous. The biggest benefit was being able to maintain full-time teaching and coaching responsibilities and remain close to my family." 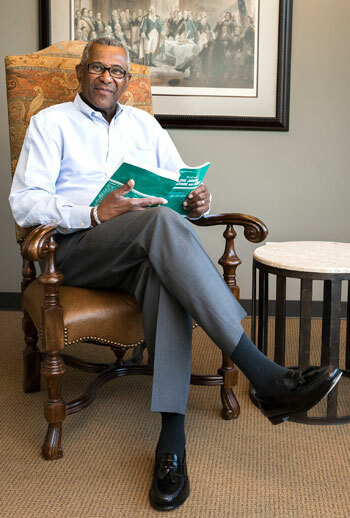 Nolden Gentry, 60BA, 64JD, came to Iowa to play basketball, but he stayed to become a lawyer and leader in the state's largest city. A top rebounder, Gentry led the Hawkeyes with 241 rebounds in 1958; his 23 boards against Michigan that year is still fourth-best in men's basketball history for a single game. He considered professional basketball after graduating with a political science degree in 1960, but instead he went to the UI College of Law. There, he met professors like Sandy Boyd, 81LHD, and Alan Vestal, who became mentors and career guides. Gentry joined the FBI after receiving his law degree and was working in Newark, N.J., when Vestal told him about an opening for an assistant attorney general in the Iowa Attorney General's office. In 1965, he returned to Iowa for good. Eventually he became a partner in his own firm—now called Brick Gentry, P.C.—and prospered while practicing mostly real estate and corporate law. And he became active in the community, too, serving over the years on the boards of directors for Firstar Bank Iowa, MidAmerican Energy, Bankers Trust, Prairies Meadows, and the Iowa Public Television Foundation. He has also been a member of the State Board of Public Instruction and president of the Des Moines School Board. Gentry's public service also included the executive committee of the United Way, governor of the Great Des Moines Community Foundation, and membership on a committee studying government ethics for the Iowa State Legislature. Now in semi-retirement, he continues to serve on the boards of Delta Dental Foundation, the Mid-Iowa Health Foundation, and Bridges of Iowa, a drug and alcohol recovery program. Like many of her fellow Iowans, Maggie Mangold, 07MD, is full of pride—in her family, her profession, and her community. So it was a natural fit when Mangold chose to return to her hometown of Vinton to begin her family medicine practice. Since her arrival at the Vinton Family Medical Clinic in 2010, Mangold has embraced her role. She enjoys the challenge of treating the wide variety of illnesses and conditions that family doctors see every day. She cares for 2-year-olds and 100-year-olds and every age in-between. And she loves establishing the doctor-patient relationships that will continue for years to come. "I've always had an interest in helping people," Mangold says. "I get a lot of job satisfaction working in a small town and giving back to my community." After graduating from Iowa's medical school, Mangold completed a residency in family medicine through the Cedar Rapids Medical Education Foundation, one of six UI-affiliated Regional Medical Education Centers (including Davenport, Des Moines, Mason City, Sioux City, and Waterloo) and home to one of eight residency programs that comprise the Iowa Family Medicine Residency Network, also administered through the UI. Mangold's story is one example of successful partnerships between doctors and the Iowa communities they serve. Fostering such win-win situations is key to the overall mission of the University of Iowa Carver College of Medicine. Mangold knew she wanted to become a doctor as early as her middle school years, and she's glad she made the decision to return to Vinton, for both her profession and her family—husband, Jeff, who's also from Vinton, and young sons, Hugh, Reid, and Theo. Adam Kruger, 12DDS, never considered any place but the University of Iowa for dental school, and his post-graduation plans came naturally, too. He returned to northeast Iowa to practice with his dad and help his hometown of Oelwein chart new directions. "I'm not only providing dental care," he says, "I'm working to be part of this community." For Kruger, that means joining Oelwein Chamber and Area Development, supporting the local high school, and helping the old railroad town welcome new businesses and young families like his (Kruger and his wife, Andrea, are parents of a 1-year-old son, Cale). In the past few years, Oelwein has opened a new library, performing arts center, and wellness center. Kruger has turned his attention to the schools, volunteering with local athletic programs. "That's really important to me," he says. "The high school should be central to a small town." Kruger's father, Al, 79DDS, also completed dental school at the UI. The Kruger family's practice is bringing some of the latest dental technology to Oelwein, including digital imaging, computer-aided restorations, and intraoral cameras that let patients see results from dental procedures up close. An Iowa education gave Kruger the tools he'll need to shape his career. He worked alongside seasoned dentists—many who taught part-time at the UI while practicing in towns like Oelwein—and got a solid introduction to every dental specialty. He knew he was getting good training, but says it's taken a little time for him to realize the full value of a UI dental degree. If you had one thousand pounds of river trash, what would you build? To anyone but David Williamson, 71BFA, 72MA, the question might seem absurd. But for the sculptor and recycling enthusiast from Boone, Iowa, it's a promising opportunity. Williamson has incorporated recycled materials into his work since the early 1970s, recently partnering with the Iowa Department of Natural Resources on its latest initiative, Project AWARE: A Watershed Awareness River Expedition. Founded in 2003, Project AWARE invites volunteers from across the state to canoe 100 miles of Iowa rivers and collect discarded materials—from bicycles to barrels. For the past decade, Williamson has been telling the story of Project AWARE and honoring its participants through interactive metal working at the Iowa State Fair. Fairgoers of all ages, as well as those who took part in the river cleanup, partner with Williamson to create castings, smelt recycled metal, and hammer together sculptures that represent the spirit of Iowa and its waterways. Williamson credits much of his creativity and artistic inclination to his time at the UI School of Art and Art History in the College of Liberal Arts and Sciences, where, he says, "instead of expecting me to answer questions, my professors were mentoring me on how to ask important questions. That opened up for me a whole new world." Williamson was born along the Mississippi River in Keokuk, and as a child he became captivated by the state's waterways. Now, his art expands conversations about the environment and its inhabitants. 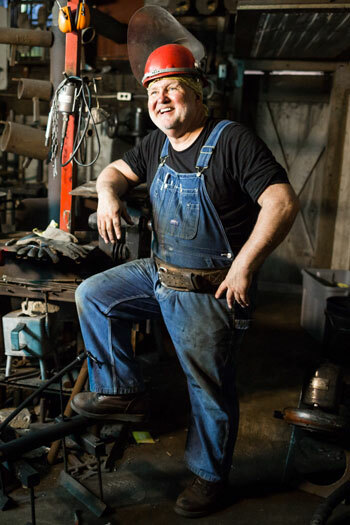 His sculptures have traveled to various venues across Iowa, helping communities communicate and connect with one another. For more Hometown Hawkeyes, visit the UI website at: http://now.uiowa.edu/hometown-hawkeyes.